There's dressing up as your favorite game or TV character, then there's assembling a massive suit of Warhammer 40K armor. Like, say, this massive suit of Warhammer 40K armor. 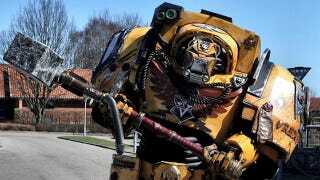 The outfit, which is based on an Imperial Fists captain in Terminator armor, was created by cosplay and prop-makers Daniel Høgh and Justina Šniukštaitė of Roses and Boltshells. In addition to the images and video here, Roses and Boltshells have posted a large gallery of the outfit over on their Facebook page. They report that it cost $2,000 USD to make, and took them 2 months working on it in their spare time. Very impressive, fellas.